Established in 1970, Hassan Janitorial has been an innovative leader in commercial/industrial cleaning and building maintenance. We understand what it takes to provide our clients with a clean, safe, healthy work environment. Your satisfaction is our 100% commitment. For over 40 years Hassan Janitorial has served the greater Bay Area. Located in the heart of Silicon Valley we have provided the highest level of cleaning and building maintenance to businesses both large and small. Since every facility has different requirements, we tailor our services to meet your every need. Hassan Janitorial is fully licensed, bonded and insured to guarantee that qualified personnel are handling your job. Our commitment and hands-on owner participation provides confidence and peace of mind to every customer. Hassan Janitorial has assembled a team of experienced and accessible managers. Our senior managers each have over 25 years of experience providing outstanding customer service to our clients. We understand communication is essential when creating good business relationships. Our managers will promptly respond to any of your questions or requests. We are confident that our partnership with you will help create a worry free clean working environment. Our managers will meet with you to analyze your facility, surface types and discuss client requirements to develop a custom program that will meet your specific cleaning needs. The management teams are experts in phasing in a seamless transition for new accounts. Account managers will coordinate routine meetings with you to review overall performance and discuss proactive recommendations to further enhance the quality of the services. Our goal is to deliver exceptional janitorial and maintenance services to our clientele. Hassan Janitorial is committed to the highest quality standards. Quality Control is the result of good hiring practices, effective training, sufficient supervisory oversight and feedback to the teams. Our field managers conduct random, objective inspections which allow us to capture the most reliable assessment of individual performance. We have developed an inspection system covering tasks performed by our day porters and night cleaners. All duties are documented on our daily checkoff lists and submitted to the crew lead at the end of each shift. 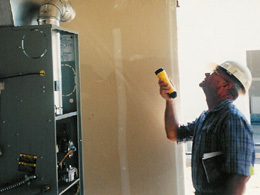 All buildings are inspected at least once per week to assure the highest quality service to our clients. Quality Emphasis is our priority. We realize that trained employees are an asset to our company and to our clients. The training we provide to our teams comprises of janitorial procedures, accident prevention and proper reporting guidelines. Hassan Janitorial has a comprehensive injury and illness prevention program that includes our code of safe practices for custodial and maintenance personnel. We prepare our employees for field operations in the proper use, handling and disposal of chemicals and hazardous substances by understanding MSDS. All employees receive detailed instructions of the operation of various equipment. Our cleanroom techs are trained in appropriate gowning, communications, respiratory protection, blood borne pathogens handling and accident prevention protocol. "Before Hassan, we were changing janitorial services every year. They go through great lengths to keep us extremely satisfied." "Hassan Complete Janitorial has the best responsive teams available in the cleaning field. They have bailed me out more than once and have been a great support to us for over 10 years." "Every level of Hassan's organization I deal with are highly motivated, proactive and responsible people. From the cleaners, supervisors, account reps and floor crews, they all have a great attitude! I could not recommend a better maintenance company."